Iperius Backup is a reliable and easy to use tape backup software, compatible with Server 2008 and Server 2012, and with any tape drive (DAT, LTO Ultrium, AIT, DLT, SDLT, SCSI, SAS, USB, etc.). It can back up open files (VSS), make disk images and restore individual files. 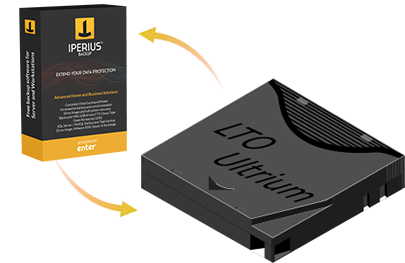 Priced at only € 149, Iperius Backup is one of the most cost effective solutions to make backups to DAT or LTO tape drives. Iperius Backup is the best alternative to expensive software such as Symantec Backup Exec and CA ARCserve. The price includes free updates and free support from the development team (no call centers). The license is perpetual and there are no hidden costs. A single installation file and the same configuration for all Windows systems (XP, 2003, Vista, 7, 8, 2008, 2012). A software to make tape backups on Server 2008 and Server 2012 at the same cost of a desktop system. Iperius Backup doesn't need any additional driver installation and requires minimal disk space and resources. Iperius Backup Advanced Tape allows you to copy open or locked files using Volume Shadow Copy (VSS), and can make images of the system disk (cloning), that can be easily copied to LTO or DAT tape. The drive image backup allows to restore a server in minutes (disaster recovery), without losing configuration and without having to reinstall all programs. The disk image is made without any service interruption (hot backup), and you can also recover your system to dissimilar hardware (hardware independent restore). Iperius Backup allows you to maximize the capacity of your tape drive, using the fast on-the-fly compression, which allows you to write many hundreds of GB on a single tape. For the safety of confidential data and the privacy regulation compliance, Iperius also allows you to encrypt your backup with the military-grade standard AES 256-bit. Iperius Backup is a software that guarantees the integrity and security of data on tape, thanks to its many monitoring and reporting functions. With LTO tape cartridges, that have an archival storage life of up to 30 years, and with the full support to the WORM mode, you can create permanent archives and tamperproof, compliant data storage (according to Sarbanes Oxley and SEC regulations). Among the most important features required of a backup software, there are definitely notification and reporting functions. Iperius Backup allows you to be always aware of the status of your backup, as it can automatically send an e-mail after each backup or only in case of errors. The backup can be scheduled at specific days and times and you can keep an history of all backup operations performed.